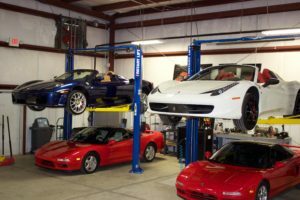 Labor rate can be such a hot topic when having your Ferrari serviced. It reminds me of when people shop for a lawyer, everyone wants to know the hourly fee. In my opinion, however, I believe that when dealing with anything of importance, the total cost for the job is what is important, not the hourly rate. I want to know going into a situation that my Ferrari Testarossa is going to cost $6,000 to fix, not that it will be $225 per hour because I have no idea how many hours it will actually take. Labor rates, parts prices, etc… all of these items are irrelevant to my end goal of a perfectly running Ferrari. Along these lines, I want to feel and know that I am addressing everything on my exotic that needs to be fixed. Pre-owned Ferraris are not just cars, they are assets that need to be managed and cared for like you would with your stock portfolio. And as you would with the investment firm you interview to manage your assets, you need to do the same with the shop that services your Ferrari or Maserati. In today’s technology driven world, you can readily access the information you need to shop around. If you take your Ferrari in to have a timing belt replaced and are quoted a total cost for the job, it’s easy for you to call around for another quote. In addition, this would be the time to use all the information on line to learn more about the Ferrari Service Centers you are considering. Find out who will be servicing your car and what their credentials are, does the shop stand behind their work (online reviews are extremely helpful), and what will your service experience be like? Do I have to wait months before I can get an appointment to come in? Will they provide me with a free loaner? How will they take care of my car while it’s there? Questions like these can end up adding to the bottom line, which is why there is so much more to consider when choosing a service shop than simply asking what the labor rate is? In addition, find a place that is willing to invite you into their shop and show you the problems they see so that you too can verify that you’re only fixing what needs to be fixed. Unfortunately, the auto industry has earned its reputation from there being a lot of dishonesty that takes place. However, there are also many extremely honest dealers who make great partners, and you will be able to tell exactly who those are when you look at all these factors. The world of exotics is very different than traditional cars in a sense that these vehicles are about peoples passions and love. Not only do the owners love their Rolls-Royce, but more often the mechanics themselves will have a love and admiration for the vehicle and its craftsmanship as well. When you find a shop that shares your same passion and appreciation for these true works of art, you will know without a doubt that you have found your shop.